A Vancouver time travelogue brought to you by Past Tense. Lieutenant Victor Bishop was an experienced RAF pilot, having flown the English Channel many times and in the Battles of the Somme and Vimy Ridge unscathed. Back home in Vancouver, he was testing a “flying boat,” a seaplane commissioned by the provincial government that was to be the first airplane in the country used to detect forest fires. The plane was an H-2 biplane, built by the Hoffar Brothers, who began building Western Canada’s first seaplanes at their boat building plant in Coal Harbour the year before. The planes were highly regarded, but that didn’t help Bishop when the engine conked out. 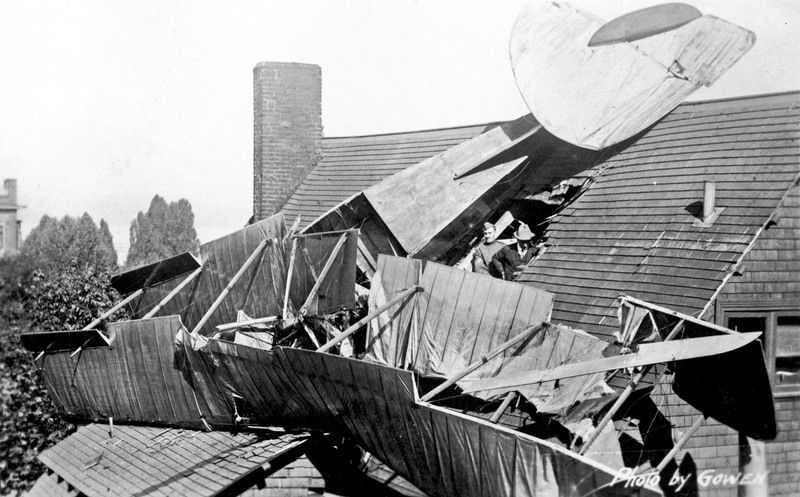 Bishop was trying for an emergency landing in Coal Harbour, but his plane dropped like an anvil into the upstairs bathroom of Dr JC Farish’s house on Bute Street. Miraculously, he survived, and after being extricated from the wreck by the housekeeper, Bishop managed to walk down the stairs and out the front door to a waiting ambulance. A huge crowd of spectators gathered around the house to view the wreckage, so many that they blocked traffic on the streets. Men, women, and children scrambled to grab souvenirs of the crash. Just the sight of an aeroplane flying overhead would’ve been quite the spectacle in 1918, let alone one falling on a house. Years later, Bishop donated a wing tip to the Museum of Vancouver. The crash doesn’t seem to have adversely affected the Hoffar Brothers reputation much. Their company was bought by Boeing as its Canadian branch in 1927, and was churning out some pretty advanced war machines from plants on West Georgia, Sea Island, and Terminal Avenue during WWII. Brother Jimmie Hoffar confessed years later that they knew almost nothing about aerodynamics when they built the H-2, and that they skipped over seemingly frivolous details like cross-bracing on the wings. He shuddered at the memory of flying thousands of feet in the air in a plane that could have crumpled like paper at any time. He also admitted that he knew nothing about flying until after he and his brother Henry built the H-1 in 1917 and used it to teach themselves how to fly. One final bit of strangeness to this story is that Duff Pattullo, the Minister of Lands and future Premier of BC who had contracted the Hoffar Brothers to build the H-2, happened to be on the phone from Victoria with someone in the Pacific Building on West Hastings during the flight. Pattullo could hear the roar of the plane’s engine over the phone, followed by the abrupt silence as Bishop plummeted into Farish’s house. As for Bishop, his injuries were minor and he quipped from his hospital bed that he couldn’t wait to get back to the theatre of war, as it posed less risk to his health than the homefront.